This tiny church is located at Via Leccosa 75, just south of the Ponte Cavour. Since 1931 the church has been the home of the Arciconfraternita degli Amanti di Gesù e Maria, detta della Via Crucis (Archconfraternity of the Lovers of Jesus and Mary, called of the Way of the Cross). The archconfraternity was founded by Saint Leonard of Port Maurice, confessor to Queen Maria Clementina, wife of King James III and VIII. King Charles IV was a member of the archconfraternity. 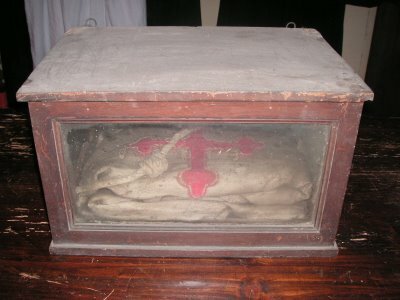 In the sacristy of the church can be seen a glass-fronted wooden box containing the confraternity habit worn by Charles IV. 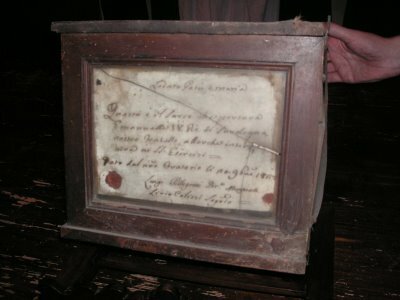 On the side of the box is a document attesting to the authenticity of the habit. The habit is a very simple brown (now much faded) gown with a red cross on the front. It was worn by Charles IV when he participated in the Way of the Cross. He passed to eternal rest, October 6, 1819. 1 Walther Buchowiecki, Handbuch der Kirchen Roms: Der Römische Sakralbau in Geschichte und Kunst von der Altchristlichen Zeit bis zur Gegenwart (Wien: Verlag Brüder Hollinek, 1967), I, 593; Vincenzo Forcella, Iscrizioni delle Chiese e d'Altri Edificii di Roma dal Secolo XI fino ai Giorni Nostri (Rome: Tipografia delle Scienze, Matematiche e Fisiche, 1869-1884), XII, 353. 2 Forcella, XII, 356. In May 2002 I enquired at the Basilica dei Santi Cosma e Damiano about what happened to the inscription, but without any success. I have not had the opportunity to enquire at San Gregorio dei Muratori. Image 2 (Document attesting to the authenticity of the habit): Ibid. © Noel S. McFerran 2000-2008.